It’s that time of year again. Last weekend kicked off the season for picnics and officially wearing white pants without fear of fashion police. On a three day holiday weekend like this past Memorial Day, I usually find myself baking for at least one barbecue, a pot luck and some other outdoor eating event. This year was no exception. So what’s my all time favorite summer dessert? Well, it’s not a cake or cupcakes as the hot sun can do a number on buttercream frosting. Humidity often makes cookies soggy. Chocolate desserts can melt and recrystalize with those dreaded streaks of grey known as “bloom”. In my experience, nothing beats baking any kind of pie from the very old, well respected “Chess” family tree. There has long been a debate about the origin of the name. Many of these pies came from the South so some people think the name “chess pie” is a colloquialism of “Jes’ pie” (or just pie). Personally, I’ve never felt convinced of that theory. Other’s claim there may have been cheese in the original recipes. However, I have extensively researched old cookbooks and have found no evidence to support that either. 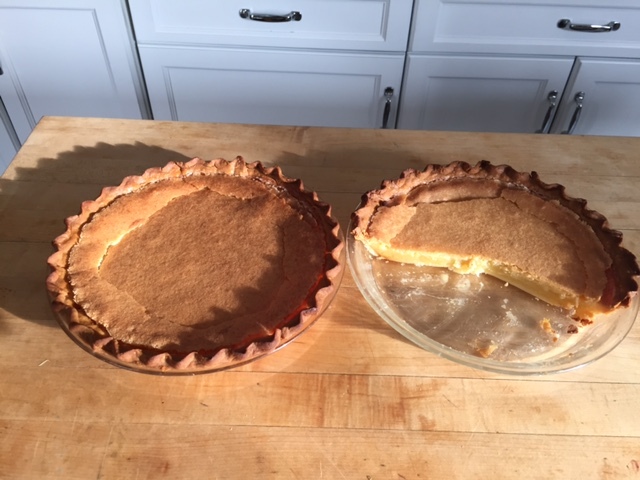 The most probable explanation is that “chess pie” evolved from the name “chest pie” and with good reason. As pastry goes, these pies are practically indestructible! They hold up well at room temperature (even in hot weather) which was why they were probably locked away in colonial tin pie chests. Transporting them is a cinch too– no smashed merigue in picnic baskets. These pies are so portable–just wrap and go as soon as they cool off from the oven. 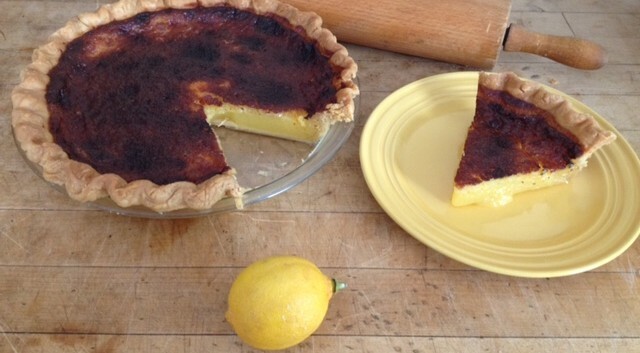 So what exactly is in a chess pie? They are filled with a simple combination of ingredients with a surprisingly rich and complex result. Always heavy on the butter and sugar, the flavor is not one to be forgotten. My most favorite of all chess pies is the most basic. 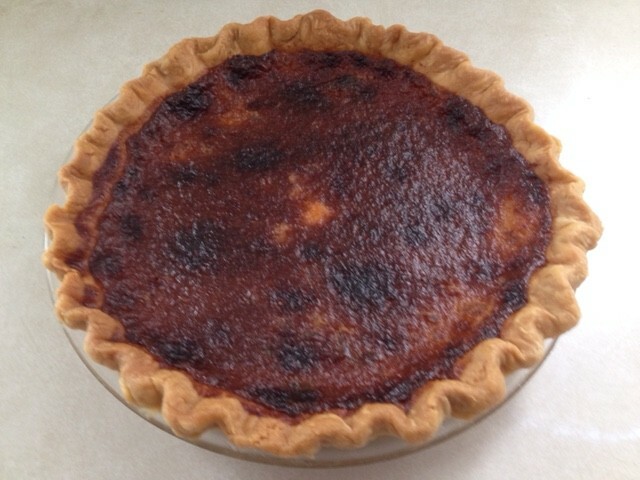 What I call Colonial Chess Pie.The secret ingredients are white vinegar and a dash of nutmeg. The combination creates a distintive and addictive custard filling. Familiar pies from the chess family include the timeless classic, pecan pie. Others are more forgotten by time like Transparent Pie or Jefferson Davis Pie. The first is simply a pecan pie sans pecans and the latter is a sugary mixture of dates and nuts. Even sweet potato and pumpkin pies are all part of the extended Chess family. 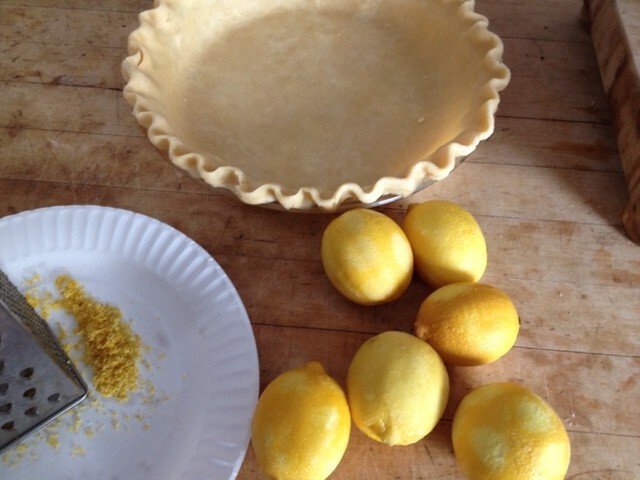 Today I’m sharing with you three of my favorite “summerpies”. The first is a Charleston Chess Pie that will really hit the spot if you are already a lover of lemon bars. The second is my humble favorite Colonial Chess Pie and the third is a fruity version of a pecan pie that I usually bake for Thanksgiving. I say “When in July, eat Louisiana Banana Pecan Pie“! Preheat oven to 375°. Combine sugar, cornstarch, cornmeal and lemon peel in a large mixing bowl. Blend in melted butter. 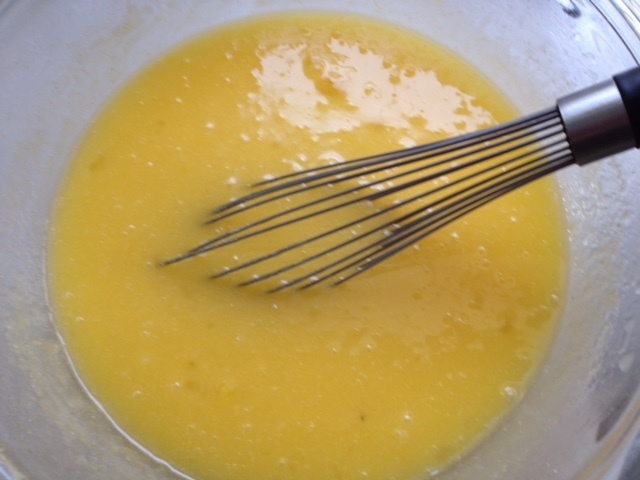 Beat lemon juice with eggs and blend into sugar mixture. 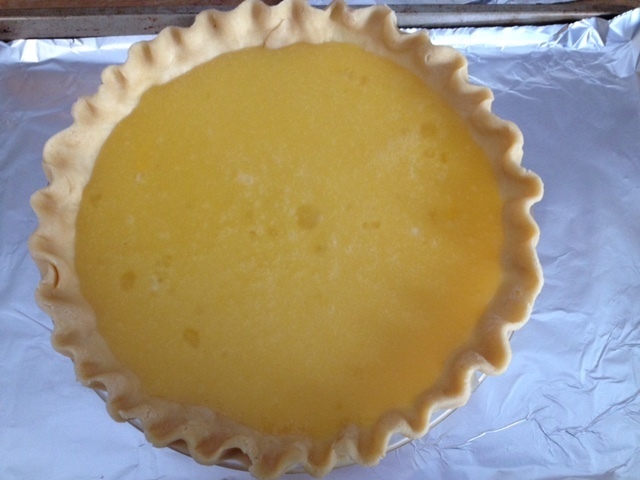 Pour into pie shell and bake on the bottom rack of oven for 40- 50 minutes or until crust is golden brown. Cool 3 hours before cutting. Sift powdered sugar over each serving slice. Preheat oven to 375°. Combine sugar, cornmeal and melted butter. Beat half and half, vanilla extract, vinegar and eggs together and pour into sugar mixture, blending until smooth. Pour into pie shall and bake on the bottom rack of the oven until crust is golden brown, cool 3 hours before cutting. Preheat oven to 375°. Combine brown sugar, cinnamon and salt in mixing bowl. Add eggs corn syrup, butter and banana liqueur or rum and blend until smooth. Line the unbaked pie shell with chopped banana and pecans. Pour filling over it and bake 40-50 minutes or until set and crust is golden brown. Cool 3 hours before slicing. In so many households, Mother’s Day dinner requires little effort other than planning ahead and dialing a phone number. According to the restaurant industry, more people eat out on Mother’s Day Sunday than any other day of the year. My birthday often coincided– or should I say collided with Mom’s day which often made it seem even more frustrating to get a table at a popular family eatery. If we could get in, our favorite dishes were off the menu, replaced with a limited choice of entree’s. One thing for sure, no reservations are required to treat Mom to breakfast in bed. When it comes to kid’s in the kitchen, French toast is fairly forgiving. There’s not too much that can go wrong. If prepared the night before, it will come out custardy. If it’s a last minute thought, it will still be fine— After all, it’s the thought that counts with Mom! 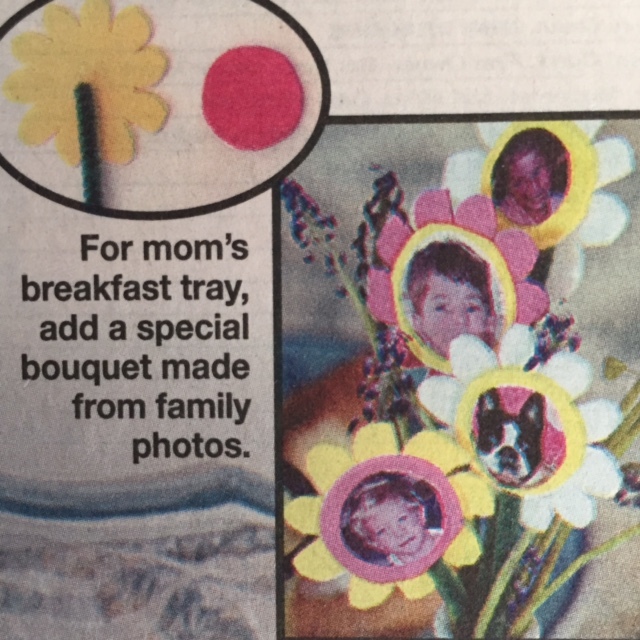 One feature to include is a bud vase of flowers with some “flower faces” of the kids (see below) in the arrangement. Beat eggs well with milk, sugar, salt, orange juice concentrate and vanilla. Place bread in a 9” x 13” casserole dish and pour egg mixture over bread. Cover an refrigerate overnight. (Note: if you do this at the last minute, just slice bread a little thinner and turn slices several times while soaking in the egg batter until saturated.) Melt enough butter in a nonstick skillet to brown toast about four minutes on each side. This may need to be done in two batches. Serve toast warm with scoops of orange butter and maple marmalade syrup. If desired , sprinkle with candied pecans. ORANGE BUTTER: Soften a 3 oz pkg of cream cheese and a 4 oz stick of butter. Beat together with 2 tsp of fresh grated orange peel until fluffy. ORANGE MARMALADE SYRUP: Heat equal parts orange marmalade and maple syrup until melted, using a saucepan or microwave. FLOWER FACES: Select photos of each child and cut out in a circle around their head. Paste in the center of flowers cut from craft foam, mounted on green pipe cleaners. 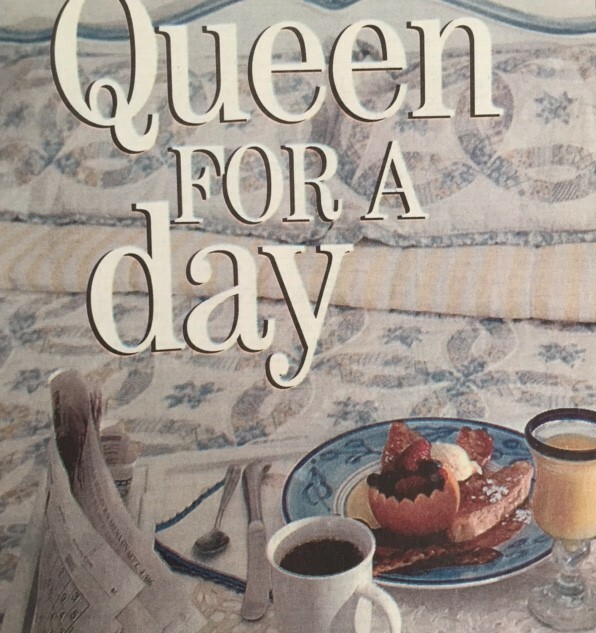 Place in a bud vase and arrange on a breakfast tray with the French toast, fresh fruit and a copy of The Connecticut Post.